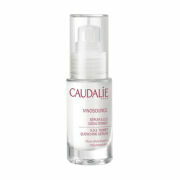 CAUDALIE Vinosource S.O.S Thirst Quenching Serum is a lightweight, oil-free, facial serum for dehydrated skin. CAUDALIE Vinosource S.O.S Thirst Quenching Serum is ultra-concentrated with highly natural ingredients and continuously captures and diffuses water deep within skin to restore moisture balance and leave skin refreshed, hydrated and comfortably soft. The fast absorbing formula is gentle enough for even the most sensitive skin types. Enriched with soothing organic Grape Water, plumping Hyaluronic Acid, and packed with antioxidants, it reveals a radiant, dewy look to any complexion. Active Ingredients: Grape Water, Hyaluronic Acid, Grape-Seed Polyphenols. Skin Type: All Skin Types, Dehydrated Skin. CAUDALIE VINOSOURCE S.O.S Thirst Quenching Serum 30ml was found on 2 websites and was price compared using EAN: 3522930001133. The cheapest CAUDALIE VINOSOURCE S.O.S Thirst Quenching Serum 30ml is shown as the main item, prices range from £29.00 to £29.00, excluding delivery. Price comparison based on price and delivery charges, with any valid discount codes being applied, is shown in the table above. Prices and information correct at the time of publication.